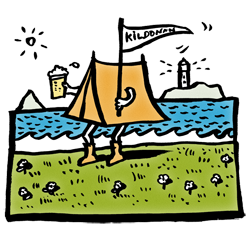 How to get to Seal Shore Camping and Touring Site in Kildonan at the South end of the Isle of Arran in Scotland. From the ferry terminal in Brodick, turn left and continue for 12 miles through Lamlash and Whiting Bay. Passing our sign, turn left to Kildonan. The site is located on the left along the shoreline. The Southend bus, no. 323, will stop at our drive upon request. Please be aware of the need to book the Car Ferry in advance, when you are booking your Arran holiday.